Beauty Salon, as the name implies, is themed around the things that are intended to make ladies more beautiful. The symbols depict a variety of beauty accessories such as make-up kits, hair dryers, hand cream, combs as well as five women with different hairstyles. Fitted with five reels and 20 paylines, the slot allows to place a bet in a wide range between $0.1 to $1000 per spin which makes it a perfect game for high rollers. Beauty Salon offers the features that would be appreciated by most slot devotees. These are a wild symbol, a scatter, and two special symbols that unlock access to bonus features. The Hair Curlers icon awards 5, 10 or 15 free spins, should you hit three, four or five of them across an active payline. 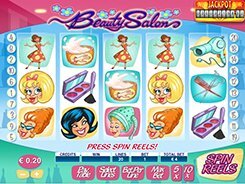 There is also a Beauty Salon mini-game that is activated by 3, 4 or 5 Bonus Hairdryers and awards up to 2000 coins. A lucky one may hit a jaw-dropping fixed jackpot worth $150,000 if five brown-haired ladies line up across an active payline. The second largest prize is not less impressive – collecting five hair sprays or five brunettes on a payline awards a huge $100,000 jackpot (if playing at max). PLAY FOR REAL MONEY!